Producer Price Differentials (PPDs) for each of the 6 Federal Milk Marketing Orders on component pricing are announced between the 10th and the 13th of the month. The PPD is an adjustment for the previous month's milk payments based on the relative volumes of each class of milk and their respective prices. New PPDs will be announced this week for April, 2009. The PPD is typically positive, however it can be negative and is another factor in the extreme volatility of milk prices. When milk prices are at $10/cwt, a change of $4.00+/cwt can be a tremendous variation. Some of this variation can be accredited to the amount of Class III milk versus other Classes. Two examples are shown below. The Upper Midwest has a smallest average PPD - $.32/cwt - and the smallest range of variation - $1.29/cwt. This is primarily because most all the milk in this Federal Milk order goes to cheese. In the March 2009 time period, 78% of the milk in the Upper Midwest order (also the largest order) went to Cheese. Therefore, there cannot be much variation between the weighted average of all Classes and Class III. 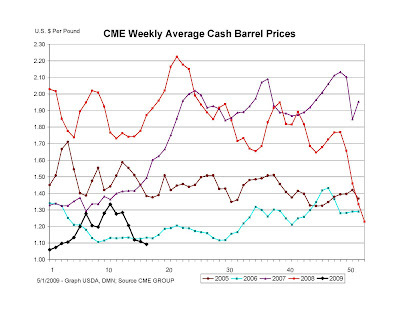 However when you look at the Northeast Federal Order, the average is $1.66/cwt and the range during the period between January 2005 and now is $4.37/cwt. As can be seen below, the largest class of milk in the Northeast Federal Order is Class I, so the weighted average of all classes is significantly different from Class III which makes up only 23% of the total milk receipts. Because the PPD is a very significant variable and the reasons for it's variability are very different among the Federal Milk Marketing Orders, each region will be examined separately in a future blog. Should you be interested, the PPD announcements can be obtained at the following links. While not showing much improvement, the Class III component prices for April at least held close to last month's prices. This is better than expected based on current cheese prices. The Class III milk price was announced Friday, May 1 at $10.78. Protein pricing and Class III milk prices are very dependent on cheese prices. The National Agricultural Statistical Service (NASS) prices lag the Chicago Mercantile Exchange (CME) prices by about two weeks (see April 2 post). 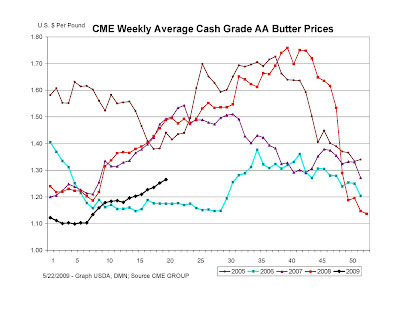 CME cheese prices - also announced on Friday - gave a different - much lower view of prices than the NASS cheese price. The NASS cheese price for April was $1.27/lb. The CME weekly cheese prices - also announced on Friday - were under $1.20/lb for both Block and Barrel prices. 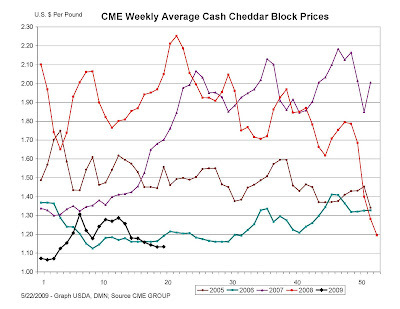 The Hoard's Dairyman comparison of NASS and CME prices helps illustrate where cheese prices are heading. The Class III prices that were announced on Friday could be taken as a sign of coming improvement in prices or at least a bottoming out of prices. Unfortunately, the leading indicators say that prices are still headed downward. It is important to remember that the majority of the milk check comes from protein. Even if the price per pound is lower, more protein is still extremely important!